Robert Charles Benchley was an American humorist best known for his work as a newspaper columnist and film actor. 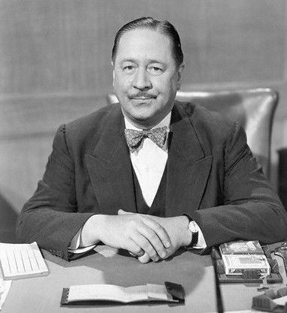 From his beginnings at the Harvard Lampoon while attending Harvard University, through his many years writing essays and articles for Vanity Fair and The New Yorker, and his acclaimed short films, Benchley's style of humor brought him respect and success during his life, from New York City and his peers at the Algonquin Round Table to contemporaries in the burgeoning film industry. Benchley is best remembered for his contributions to The New Yorker, where his essays, whether topical or absurdist, influenced many modern humorists. He also made a name for himself in Hollywood, when his short film "How to Sleep" was a popular success and won Best Short Subject at the 1935 Academy Awards, and his many memorable appearances in films such as Alfred Hitchcock's "Foreign Correspondent" and a dramatic turn in "Nice Girl?" His legacy includes written work and numerous short film appearances. A great many people have come up to me and asked how I managed to get so much done and still look so dissipated. The secret of my incredible energy and efficiency in getting work done is a simple one. The psychological principle is this: anyone can do any amount of work, provided it isn't the work he is supposed to be doing at that moment.